A friendly and inclusive community space aims to break down many of the barriers that stop people with disabilities from enjoying a varied and meaningful social life. Art has been showcased as the latest vivid example of how people with learning disabilities can and should play a central role in communities. 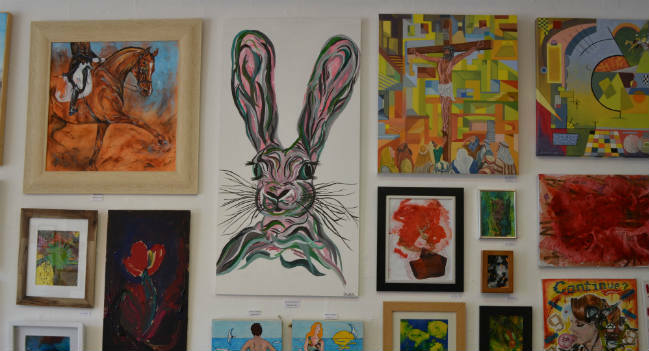 The United Response charity's Community Network invited local artists – with and without disabilities – to exhibit their art work including paintings and sculptures this month. United Response Community & Practice Development Coordinator Corrina Cross said: "We wanted to showcase the talent of Folkestone but also to organise an event that would open the door to people who are often isolated and feel alone." "People with autism, mental health needs and physical or learning difficulties have so much to give and by holding such an event, we’re able to place them in the heart of their communities." United Response’s Cheriton Community is a friendly and inclusive community space which aims to break down many of the barriers that stop people with disabilities from enjoying a varied and meaningful social life. Martine Norton, United Response Area Manager for Kent, said: "We wanted to empower those left on the margins of society and to give them a platform to express themselves." "The exhibition also helps to tear down preconceptions of what people with disabilities are able to do." The network also hosts many other events open to everyone in the community throughout the year including ukulele practice, open mic nights, drumming lessons, line dancing and discos.